The other day I wrote about DJ/producer/blogger Lady Citizen's (aka Jun Fukunaga) re-released track, 'Gone Love Song' – a fresh, sample-juddering jar of skate-hop. 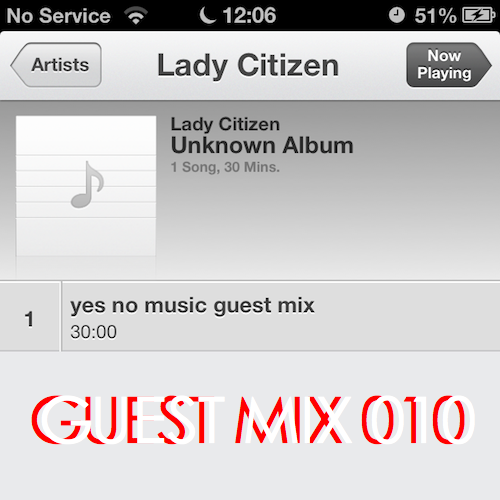 I promised a surprise, and, well, here it is – a Guest Mix! The tenth! Double-figures! Let's somersault into the unknown! ****! This is an enjoyable one to say the least, I wanna spin on my back like a turtle in a shell, wiggle my toes so fast that I rocket into the future. All that stuff. Beginning with a Magical Mistakes remix of the awesome Metome, now a choppy 2/4 affair of blazing synth; through the bass-heavy Bok Bok-produced Drive-glistening 'Guns & Synth' by Kelela – and Slow Magic's incredible sampling of Justin Bieber in the boom trap-rattling 'Your Heart Beats'; to the saxophonic jazzstep of Tokyo-based Ohm's footwork-inflected 'Return Trip' and soulful synth chill in 'Step By Step' from Yusaku Harada; ending with one of Lady Citizen's own, tumbling euphoric house track 'Unforgettable Rainy Day'. But like I shouldn't be talking so much about it. You should be listening to this half-an-hour-on-the-dot collection of footwork, house, and dubstep-friendly tunes, overarched with stylised synth and a penchant for the chilled side of life. Yeah that summed it up. Now— Enjoy!